Fatehi, F., Fatemi, I., Shamsizadeh, A., Hakimizadeh, E., Bazmandegan, G., Khajehasani, F., Rahmani, M. (2017). The effect of hydroalcoholic extract of Pistacia vera on pentylenetetrazole-induced kindling in rat. 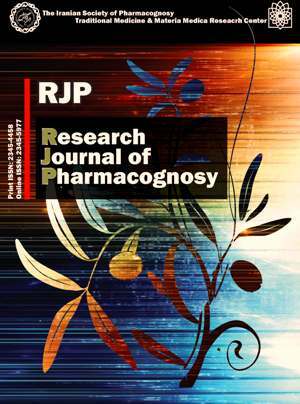 Research Journal of Pharmacognosy, 4(2), 45-51. F. Fatehi; I. Fatemi; A. Shamsizadeh; E. Hakimizadeh; Gh. Bazmandegan; F. Khajehasani; M. Rahmani. "The effect of hydroalcoholic extract of Pistacia vera on pentylenetetrazole-induced kindling in rat". Research Journal of Pharmacognosy, 4, 2, 2017, 45-51. Fatehi, F., Fatemi, I., Shamsizadeh, A., Hakimizadeh, E., Bazmandegan, G., Khajehasani, F., Rahmani, M. (2017). 'The effect of hydroalcoholic extract of Pistacia vera on pentylenetetrazole-induced kindling in rat', Research Journal of Pharmacognosy, 4(2), pp. 45-51. Fatehi, F., Fatemi, I., Shamsizadeh, A., Hakimizadeh, E., Bazmandegan, G., Khajehasani, F., Rahmani, M. The effect of hydroalcoholic extract of Pistacia vera on pentylenetetrazole-induced kindling in rat. Research Journal of Pharmacognosy, 2017; 4(2): 45-51. 1Physiology-Pharmacology Research Center, Rafsanjan University of Medical Sciences, Rafsanjan, Iran. 2Physiology-Pharmacology Research Center, Rafsanjan University of Medical Sciences, Rafsanjan, Iran. Physiology-Pharmacology Department, Rafsanjan University of Medical Sciences, Rafsanjan, Iran. 4Department of Radiology, Rasoul-e-Akram Hospital, Iran University of Medical Sciences, Tehran, Iran. 5Physiology-Pharmacology Research Center, Rafsanjan University of Medical Sciences, Rafsanjan, Iran. Physiology-Pharmacology Department, Rafsanjan University of Medical Sciences, Rafsanjan, Iran. Background and objectives: Most antiepileptic drugs that are commonly being used in the clinic have a wide range of unwanted side effects; while some species of pistachioshave been used in the traditional medicine to treat epilepsy. The aim of the present study was to investigate the anticonvulsant effects of the hydroalcoholic extract of Pistacia vera L. in pentylenetetrazole (PTZ)-induced chemical kindling. Methods: this study was carried out on 40 male Wistar rats. Chemical kindling was induced by intraperitoneal administration of PTZ (40 mg/kg) on every alternate day (30 days). The hydroalcoholic extract of P. vera (50 and 100 mg/kg) were administered orally every day (30 days). In days which animals received both PTZ and extract, PTZ was injected 30 min after extract administration. Convulsive behavior was observed for 30 min after PTZ injection and scored according to racine scale. Diazepam was used as the reference anticonvulsant drug. Results: Pretreatment with 50 and 100 mg/kg of P. vera extract decreased seizure scores, stage 4 latency and stage 5 duration compared to the control group. The anti-epileptic effects of P. vera extract were comparable to diazepam. Conclusion: The present findings demonstrated that the hydroalcoholic extract of P. vera may inhibit the development of seizure behavior following chronic PTZ-induced model of epilepsy in rats. Pitkanen A, Sutula TP. Is epilepsy a progressive disorder? Prospects for new therapeutic approaches in temporal-lobe epilepsy. Lancet Neurol. 2002; 1(3): 173-181. Sendrowski K, Sobaniec W. Hippocampus, hippocampal sclerosis and epilepsy. Pharmacol Rep. 2013; 65(3): 555-565. Kiasalari Z, Khalili M, Roghani M, Heidari H, Azizi Y. Antiepileptic and antioxidant effect of hydroalcoholic extract of Ferula assa foetida gum on pentylentetrazole-induced kindling in male mice. Basic Clin Neurosci. 2013; 4(4): 299-312. Jalili C, Salahshoor M, Pourmotabbed A, Moradi S, Roshankhah S, Darehdori AS, Motaghi M. The effects of aqueous extract of Boswellia Serrata on hippocampal region CA1 and learning deficit in kindled rats. Res Pharm Sci. 2014; 9(5): 351-360. Bhutada P, Mundhada Y, Bansod K, Dixit P, Umathe S, Mundhada D. Anticonvulsant activity of berberine, an isoquinoline alkaloid in mice. Epilepsy Behav. 2010; 18(3): 207-210. Hansen SL, Sperling BB, Sánchez C. Anticonvulsant and antiepileptogenic effects of GABA A receptor ligands in pentylenetetrazole-kindled mice. Prog Neuropsychopharmacol Biol Psychiatry. 2004; 28(1): 105-113. Kupferberg H. Animal models used in the screening of antiepileptic drugs. Epilepsia. 2001; 42(s4): 7-12. Engel Jr J. Surgery for seizures.N Engl J Med. 1996; 334(10): 647-653. Shahraki J, Zareh M, Kamalinejad M, Pourahmad J. Cytoprotective effects of hydrophilic and lipophilic extracts of Pistacia vera against oxidative versus carbonyl stress in rat hepatocytes. Iran J Pharm Res. 2014; 13(4): 1263-1277. Tomaino A, Martorana M, Arcoraci T, Monteleone D, Giovinazzo C, Saija A. Antioxidant activity and phenolic profile of pistachio (Pistacia vera L., variety bronte) seeds and skins. Biochimie. 2010; 92(9): 1115-1122. Ahmad NS, Waheed A, Farman M, Qayyum A. Analgesic and anti-inflammatory effects of Pistacia integerrima extracts in mice. J Ethnopharmacol. 2010; 129(2): 250-253. Parvardeh S, Niapoor M, Hosseinzadeh H. Hepatoprotective activity of Pistacia vera L. gum extract in rats. J Med Plants. 2002; 1(4): 27-34. Jain P, Tambe R, Sancheti J, Nahire M, Bhardwaj A, Sathaye S. Screening of Pistacia integerrima extracts for their anticonvulsant activity in acute zebrafish and rodent models of epilepsy. Int J Nutr Pharmacol Neurol Dis. 2015; 5(2): 56-63. Abdollahi Fard M, Shojaii A. Efficacy of Iranian traditional medicine in the treatment of epilepsy. Biomed Res Int. 2013; Article ID 692751. Vieira V, Glassmann D, Marafon P, Pereira P, Gomez R, Coitinho AS. Effect of diclofenac sodium on seizures and inflammatory profile induced by kindling seizure model. Epilepsy Res. 2016; 127(1): 107-113. Corda M, Giorgi O, Longoni B, Orlandi M, Biggio G. Decrease in the function of the γ-Aminobutyric acid-coupled chloride channel produced by the repeated administration of pentylenetetrazol to rats. J Neurochem. 1990; 55(4): 1216-1221. White HS. Comparative anticonvulsant and mechanistic profile of the established and newer antiepileptic drugs. Epilepsia. 1999; 40(5): 2-10. Meldrum B. GABA-agonists as anti-epileptic agents. Adv Biochem Psychopharmacol. 1981; 26(2): 207-216. Homayoun M, Seghatoleslam M, Pourzaki M, Shafieian R, Hosseini M, Ebrahimzadeh Bideskan A. Anticonvulsant and neuroprotective effects of Rosa damascena hydro-alcoholic extract on rat hippocampus. Avicenna J Phytomed. 2015; 5(3): 260-270. Rezvani ME, Roohbakhsh A, Allahtavakoli M, Shamsizadeh A. Anticonvulsant effect of aqueous extract of Valeriana officinalis in amygdala-kindled rats: possible involvement of adenosine. J Ethnopharmacol. 2010; 127(2): 313-318. Ziaee T, Hosseinzadeh H. Muscle relaxant, hypnotic and anti-anxiety effects of Pistacia vera gum hydroalcoholic extract in mice. J Med Plants. 2010; 9(36): 96-105. Suzuki K, Omura S, Ohashi Y, Kawai M, Iwata Y, Tani K, Sekine Y, Takei N, Mori N. FK506 facilitates chemical kindling induced by pentylenetetrazole in rats. Epilepsy Res. 2001; 46(3): 279-282. Aguiar CC, Almeida AB, Araujo PV, de Abreu RN, Chaves EM, do Vale OC, Macedo DS, Woods DJ, Fonteles MM, Vasconcelos SM. Oxidative stress and epilepsy: literature review. Oxid Med Cell Longev. 2012; Article ID 795259. Ambrogini P, Minelli A, Galati C, Betti M, Lattanzi D, Ciffolilli S, Piroddi M, Galli F, Cuppini R. Post-seizure α-tocopherol treatment decreases neuroinflammation and neuronal degeneration induced by status epilepticus in rat hippocampus. Mol Neurobiol. 2014; 50(1): 246-256. Kumar A, Lalitha S, Mishra J. Hesperidin potentiates the neuroprotective effects of diazepam and gabapentin against pentylenetetrazole-induced convulsions in mice: possible behavioral, biochemical and mitochondrial alterations. Indian J Pharmacol. 2014; 46(3): 309-318. Kim DK. Increased seizure susceptibility and up-regulation of nNOS expression in hippocampus following recurrent early-life seizures in rats. J Korean Med Sci. 2010; 25(6): 905-911. Fernández Cancio M, Fernández Vitos EM, Imperial S, Centelles JJ. Structural requirements of benzodiazepines for the inhibition of pig brain nitric oxide synthase. Mol Brain Res. 2001; 96(1): 87-93. Hosseinzadeh H, Sajadi Tabassi SA, Milani Moghadam N, Rashedinia M, Mehri S. Antioxidant activity of Pistacia vera fruits, leaves and gum extracts. Iran J Pharm Res. 2012; 11(3): 879-887. Gentile C, Perrone A, Attanzio A, Tesoriere L, Livrea M. Sicilian pistachio (Pistacia vera L.) nut inhibits expression and release of inflammatory mediators and reverts the increase of paracellular permeability in IL-1β-exposed human intestinal epithelial cells. Eur J Nutr. 2015; 54(5): 811-821. Bozorgi M, Memariani Z, Mobli M, Salehi Surmaghi MH, Shams Ardekani MR, Rahimi R. Five Pistacia species (P. vera, P. atlantica, P. terebinthus, P. khinjuk, and P. lentiscus): a review of their traditional uses, phytochemistry, and pharmacology. Scientific World J. 2013; Article ID 219815. Han JY, Ahn SY, Kim CS, Yoo SK, Kim SK, Kim HC, Hong JT, Oh KW. Protection of apigenin against kainate-induced excitotoxicity by anti-oxidative effects. Biol Pharm Bull. 2012; 35(9): 1440-1446. Nobrega FF, Salvadori MG, Masson CJ, Mello CF, Nascimento TS, Leal Cardoso JH, de Sousa DP, Almeida RN. Monoterpenoid terpinen-4-ol exhibits anticonvulsant activity in behavioural and electrophysiological studies. Oxid Med Cell Longev. 2014; Article ID 703848.